" Secretarybirds will stay close to their mate even if their chick has already left." Hehe... Finally after so long, I can get to it again! 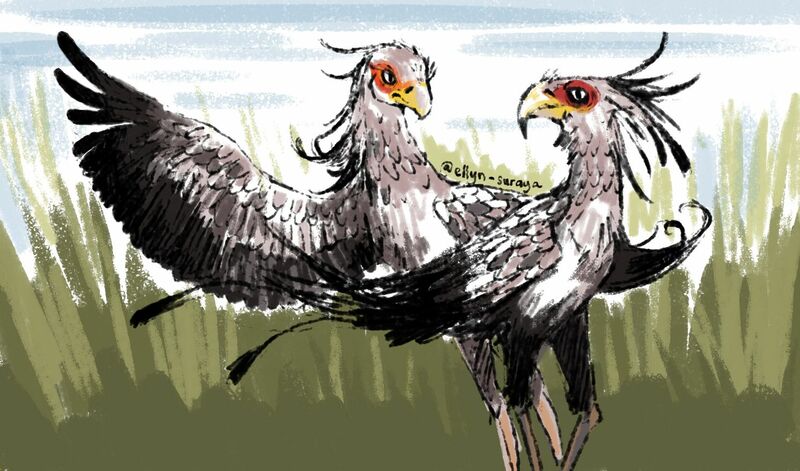 :) Have you guys heard of secretary birds? I thought of drawing a couple this time because I've always thought these birds are SO cool. The way they look and the way they act definitely has the essence of dinosaurs. These two are a newly wed couple, and the male and the female both do a lot of the hunting for each other. "Sweetie, what's this?" the female asked her mate at the sight of a delicious-looking mouse at the front of their home. She picked it up with her clawed feet, the sharp claws digging into the soft, bloodied fur. "I should be asking you as well," he said through a muffled voice. When she turned he had a dead lizard of a bright green colour in his mouth, a gift she had gotten especially for him. He swallowed the lizard whole and gave her a gentle smile. "Oh sweetie, you found your present!" she cooed. "And you found yours," he replied with a chuckle. They both laughed, their croaks rising and falling in the air happily. Their feathers ruffled in delight, they gave each other a loving gaze as their laughter died down. She then proceeded to eat her mate's present, a nice snack that would surely satiate her hunger for the night. "This is the third time this week, I think we'll be great mates." She cooed in agreement and they both tucked in for the night, the cool Savannah breeze gently rocking them to sleep. Here's a simple GIF to understand my sketching and colouring process. All pretty simple and very fun to do. Oops! I didn't notice this! Thanks for the warm welcome ^^"
great art as usual..nice style ellyn!! Also, sir, I emailed you with what you asked of me the other day. Just wondering if it reached you. The email I sent is the same, maybe it went into the junk folder? Any-who, I've re-sent it :) Hope it reaches you.